Crowley, along with a Representative from DOT and other officials discuss Vision Zero at Monday evening’s Town Hall meeting. 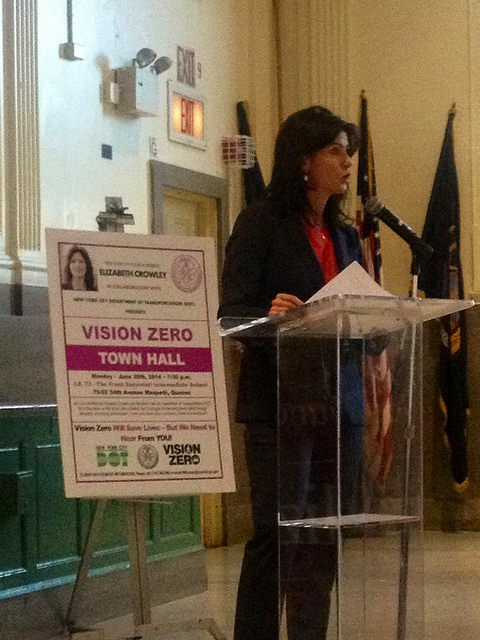 On the heels of sweeping traffic reforms being signed into law, City Councilwoman Elizabeth Crowley (D-Maspeth) took to her home district to discuss some of the latest Vision Zero accomplishments as the city cracks down on street safety. 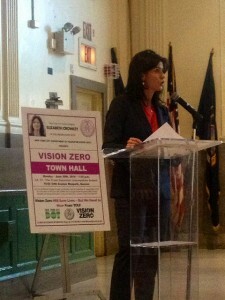 Crowley speaks at Vision Zero Town Hall meeting in Maspeth. 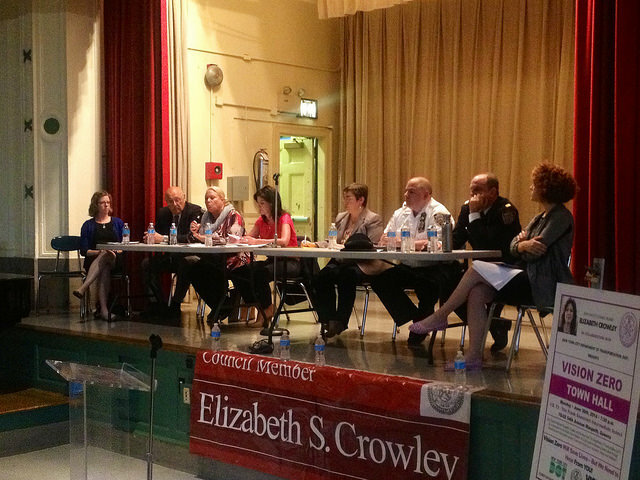 Crowley joined with members of the city Department of Transportation at a Monday night town hall at IS 73 to talk about the newest reforms, including the reduction of the city speed limit from 25 miles per hour to 30 miles per hour. 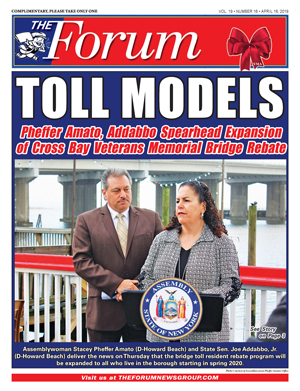 De Blasio signed 11 traffic bills into law last week in Woodside and said one of the most noteworthy reforms included lowering the city’s default speed limit from 30 to 25 miles per hour. He picked the intersection in Woodside because it was the same site where Nahian was hit and killed at 61st Street and Northern Boulevard in while he was walking with his sister to PS 152. That intersection has since been transformed with two new pedestrian islands, new crosswalks and parking regulation changes. The town hall also looked into some of the biggest obstacles keeping Mayor Bill de Blasio’s Vision Zero initiative into a reality, including bicyclists and transporting students throughout the city. The mayor rolled out the plan earlier this year with the ultimate goal of reducing traffic-related casualties citywide to zero over the next decade. 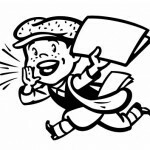 A Crowley spokesman said the Police Department was working on plans to crack down on bicyclists who violate standard traffic laws – which has gone somewhat unenforced for years. He also said the Transportation Department would be looking into ways to make 70th Street a safer place for pedestrians after some severe traffic incidents there over recent months. Last fall, five Queens IS 73 students were seriously injured when a driver lost control of his car and hit the children walking to school, leaving three with broken bones . In January, Angela Hurtado, 68, was also killed while crossing Grand Avenue after a driver made an illegal turn onto Grand Avenue from 69th Place. The legislation also included requirements for the city DOT to repair traffic signals within one day of being notified and install seven Neighborhood Slow Zones this year and next year while lowering speeds to 15-20 miles per hour near 50 schools each year.